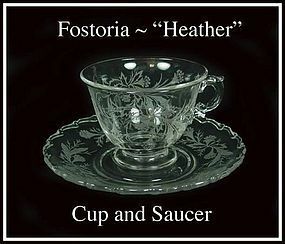 This Fostoria "Heather" cup and saucer is in excellent condition! We have 8 cup and saucer sets available @ $10.00 per set. 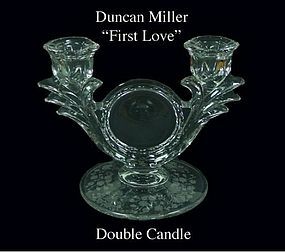 This Duncan Miller First Love double candle is in excellent condition! This Fostoria pattern was made from 1969~1974. It is called MESA and this color of blue is the most desirable in this pattern. This 8 inch blue luncheon plate is in unused condition and has a ground bottom! There are 8 plates available @ $9.00 each. 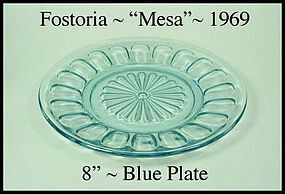 This Fostoria pattern was made from 1969~1974. It is called MESA and this color of blue is the most desirable in this pattern. 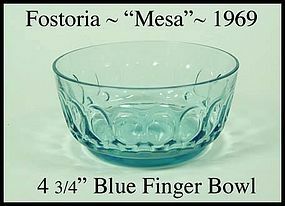 This 4 1/4" blue finger/cereal bowl is in unused condition and very beautiful! All of the bowls we have are signed! There are 7 signed bowls available @ $8.50 each. This Fostoria pattern was made from 1969~1974. It is called MESA and this color of blue is the most desirable in this pattern. 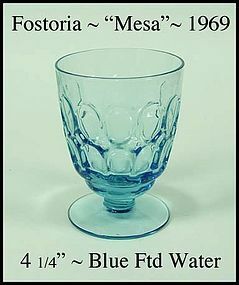 This 9oz blue water tumbler is in unused condition and very beautiful! Each of these tumblers are signed on the bottom! There are 7 signed tumblers available @ $8.50 each. This Fostoria pattern was made from 1969~1974. It is called MESA and this color of blue is the most desirable in this pattern. 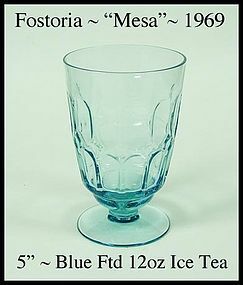 This 12oz blue ice tea is in unused condition and very beautiful! Each of the tumblers are signed! There are 7 signed tumblers available @ $8.50 each. 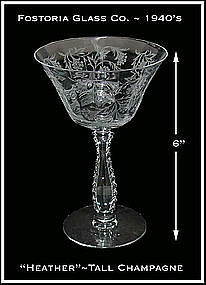 Fostoria Heather tall champagne sherbert in excellent condition.